Current and future Kellogg Community College students will have the opportunity to complete the bulk of the enrollment processes they need to start classes this fall in one afternoon during KCC’s free Registration Open House on July 18. 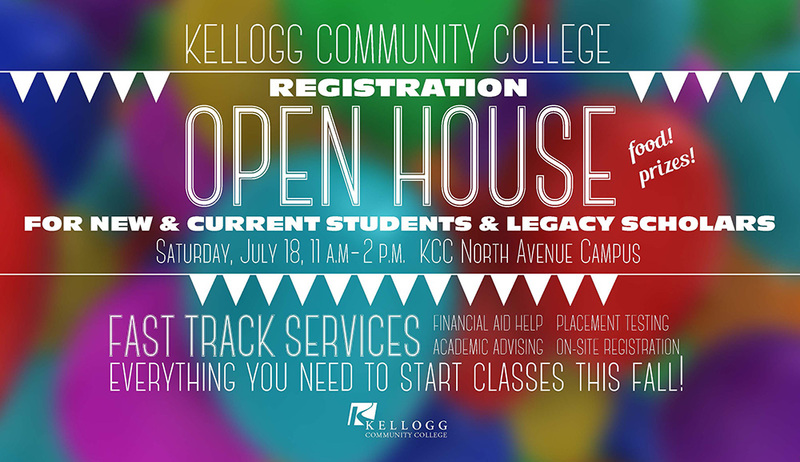 KCC’s Registration Open House is free and open to the public and will run from 11 a.m. to 2 p.m. in the Student Center area of KCC’s campus at 450 North Ave., Battle Creek. Participants can stop in for financial aid assistance, complete required placement testing, get academic advising and register for fall classes onsite, in addition to other opportunities. Legacy Scholars students, in particular, are encouraged to stop in for the free food, prize giveaways and information about KCC degrees and certificates offered at the Open House. Meredith Stravers, director of Admissions at KCC, said the event is designed to help students check off as many of the tasks they need to complete in order to start fall classes, in one place and in a single afternoon. While all of these services are available during KCC’s regularly scheduled business hours, some by appointment only, Stravers emphasized the convenience of getting all of them accomplished in one place, at one time, well before the start of the fall semester. Anyone who attends the Open House, including friends and family members of prospective students, can enter a drawing for a chance to win a Kindle Fire HD tablet computer or a $100 gift card to the Bruin Bookstore. Adding to the appeal of the Registration Open House is a recently announced registration incentive that any student who enrolls in at least one Fall 2015 course at KCC by the end of June will be automatically entered into a drawing to win a $500 tuition grant; any student who enrolls during the month of July will be automatically entered into a drawing to win a $250 tuition grant. The grants — the winners of which will be announced before the start of the fall semester — will be immediately applied to the winning students’ fall tuition bill.